Stamkos and the Sabres; Is it a fit? Steven Stamkos and his pending free agency have been in the news since last July, when he was first eligible to sign an extension with the Lightning. Despite Steve Yzerman’s decision to hang on to their talisman at the deadline in favor of a playoff run it seems that the days of Stamkos in Tampa Bay are coming to an end. It had always been widely believed that Stamkos would head closer to home and join the Toronto Maple Leafs, but recently that opinion has started to change a bit. Bob McKenzie, Nick Kypreos, and Darren Dreger have all discussed possible destinations for the Tampa Bay captain, and all three have Buffalo in assorted positions on the list of potential suitors. As recently as this week the Sabres were given the highest odds outside of Tampa Bay to sign the former 60 goal man. Stamkos to Buffalo talk dominated local sports talk both through main stream media and the Twitterverse for a solid period of time, and it is sure to heat up again as we inch closer to the draft and July 1. While measuring the likelihood of a player to sign with odds may be strange, I don’t think that Stamkos to Buffalo is a slam dunk. There are a number of pros and cons to consider as it pertains to the Sabres and this summer’s biggest free agent fish. The first order of business is the contract; what will Stamkos be looking for on July 1, and can the Sabres afford such a commitment? Stamkos’ current deal with Tampa earns him $7.5 million a year, and he will be looking at a substantial raise. If reports are to be believed an 8 year, $64 million offer was quickly rejected, and it will likely take at least $10 million per season to sign the player. Tim Murray would also likely have to offer the maximum in terms of contract length, which would result in a seven-year offer worth around $70 million. A seven-year, $73.5 million offer would make Stamkos the highest paid player in the league (along with Chicago’s Jonathan Toews and Patrick Kane) so, for argument’s sake let’s assume that will be the Sabres’ offer to Stamkos. Assuming Stamkos would pull a $10.5 million cap hit, can the Sabres afford to take on such a burden? When you have the type of owner the Sabres do, money isn’t really an issue. The team is also in good shape to add a deal this big from a cap perspective. The Sabres have plenty of cap space available for next season and only have seven players under contract for the 2017-18 season, and two of them (Sam Reinhart and Jack Eichel) are on entry-level deals with one more (Josh Gorges) a possible trade candidate. While there are six restricted free agents that will need contacts this summer only one (Rasmus Ristolainen) is in line for a significant long-term contract; the others will likely receive bridge contracts with moderate raises. The significant contract extensions such as Jack Eichel, Sam Reinhart, Robin Lehner, and possibly Mark Pysyk will need to be done in the summer of 2018 or 2019. With that being the case the Sabres would start to experience cap issues in three or four years. So from a talent perspective, Stamkos is an obvious fit. From a long-term financial perspective, things are murky. However, is Buffalo a fit for Stamkos? Or for any other franchise for that matter? Based on the various media reports that have come out, Stamkos wants to win now and be remembered as an all-time great. He also doesn’t appear to be a fan of the media circus that would follow him in a market like Toronto or Montreal. He also will want to sign with a team that is ready to win now, not three or more seasons from now. The Sabres won’t be planning any Cup parades any time soon, but they’re certainly set up for a prolonged period of success. The young core of Eichel, Reinhart, O’Reilly could be very enticing to Stamkos as he would likely get to play with at least one of the Sabres’ budding stars. Much has been made of Stamkos’ desire to play center, something he hasn’t been able to do much of this season until recently. Depending on who you ask, playing center is either paramount to Stamkos’ future desires or at least one of the primary factors he’s taking into consideration. However, recent acquisitions have strengthened Buffalo’s depth chart at the pivot. Now, if it meant playing alongside Jack Eichel each night, would Stamkos be okay playing wing in Buffalo? It’s also easy to say that O’Reilly can just move to wing in order to make room for Stamkos despite the results O’Reilly has produced at center in his first season with the Sabres. So despite the hole in their lineup, the Sabres don’t exactly have a spot ready and waiting for Stamkos. Things could change overnight in Toronto if Auston Matthews is added to their impressive group of prospects. But from a center standpoint, the Leafs certainly have a bit more room for Stamkos. Buffalo is also situated close enough to Stamkos’ hometown of Markham to appease his desire to be close to home and the media scrutiny would be far less what he’d expect to experience in Toronto. The daily media scrums in Buffalo would be a fraction of the size of the ones in other markets, and potential scrutiny would also be mild compared to the center of the hockey universe. The fanfare here probably wouldn’t be too different given the hockey mad fans the Buffalo and the Greater Toronto Area boasts. So, while the Sabres boast the cap room and proximity that would please Stamkos, the timeline of their rebuild and positional needs don’t exactly align with what you’d assume Stamkos is looking for. Now for the part people might not want to hear: just because there are attributes that make Buffalo a sensible place to play from Stamkos’ perspective doesn’t mean it would be sensible from an organizational standpoint for the Sabres to sign him. To be clear there’s not one team in the NHL that wouldn’t take Steven Stamkos with open arms, but there are other factors to consider when discussing whether or not the Sabres would be making a good decision to sign him. The first question to be answered is obviously whether or not the player is worth upwards of $10 million a year. The Sabres are in obvious need of more scoring and Stamkos would go a long way to remedying that. The team would be able to ice a very formidable top six every night with Stamkos in the lineup. There are, however, some things to be leery of. Stamkos may not ever be the 90 point player he was prior to his nasty leg injury in 2014, which isn’t totally unexpected, but his numbers have been in decline since then. Stamkos’ 5 on 5 stats are trending downward. He was able to put up 25 goals and 42 points at 5 on 5 last season, yet has netted only 14 goals at even strength this year. Most alarming for me in terms of the even strength play from Stamkos is that he’s not generating the chances we are accustomed to seeing. His shooting percentage is down about 1.1%, and he is putting up nearly three shots less per game this season as compared to the 2014-15 campaign. The Lightning are scoring almost a full goal less per 60 minutes when Stamkos is on the ice at 5 on 5 this season as compared to 2013-14 (3.335 to 2.347). Stamkos is also fairly one dimensional player; he has never averaged more than 30 seconds of shorthanded ice time per game in any season, and gets more offensive zone starts than defensive starts. That is not a particularly terrible thing, as there of plenty of players in the league who don’t kill penalties, but there aren’t many looking for $10 million plus per season. There are some possible reasons for this downturn. Chief among them is Stamkos’ usage. With John Cooper opting to keep The Triplets together, Stamkos has seen most of his ice time with the likes of Vladislav Namestnikov, and Ryan Callahan. Both of those players are solid NHLers, but the argument could be made that #91 has had to play with second and third liners all year. Stamkos has skated mostly with Callahan and Alex Killorn over the last 16 games, and has posted 12 points (8+4); in the 15 prior to that his linemates were Ondrej Palat and Namestnikov, and he tallied 13 points (6+7). Playing at a 0.75 to 0.87 points per game pace is certainly a very nice clip; sustain it for a full season and you end up in the 62 to 71 point territory. That is no doubt a solid year, but probably not $12-13 million solid. If the Sabres are to invest $70-80 million dollars in Steven Stamkos they’d be wagering that his recent statistical slide was a result of outside factors rather than Stamkos’ own doing. Tim Murray would be betting that pairing him up with Jack Eichel would net instant offense and one of the most formidable lines in the NHL. It’s certainly a pretty solid idea, but it’s also far from a sure thing. Dan Bylsma has spent the better part of a season trying to find a pair of wingers for Eichel, and his efforts have finally begun to bear fruit as he and Sam Reinhart have developed impressive chemistry. Eichel likes to improvise through the neutral zone, which is not a bad thing when you have the skill he possesses, but that can throw off linemates who aren’t prepared for it. That isn’t to say that him and Stamkos wouldn’t hit it off, but it might not be instantaneous. Given Bylsma’s penchant for shuffling his lines, it wouldn’t be shocking if Stamkos was rotated to other lines if he and Eichel didn’t instantly bond. 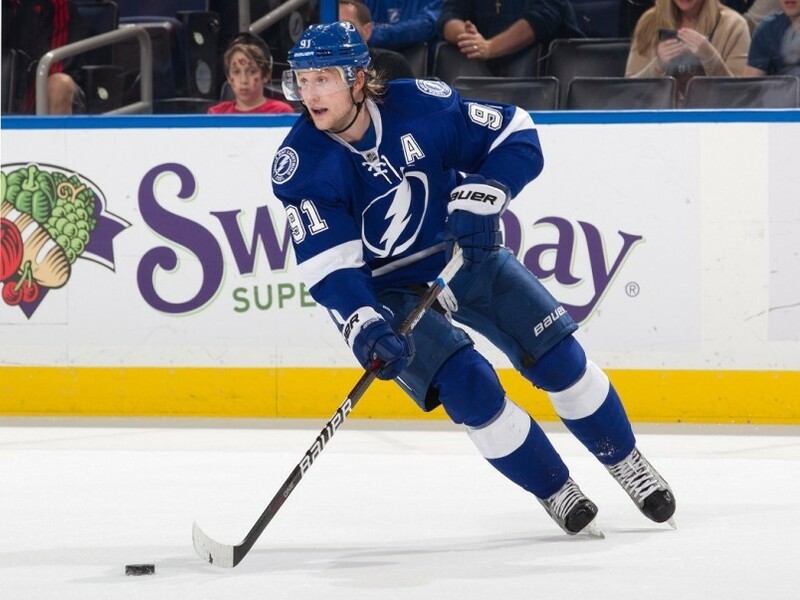 If Stamkos were to want to play center it would present a different set of issues. Stamkos would slot in on top of a depth chart that includes Ryan O’Reilly and Jack Eichel along with Johan Larsson, Tim Schaller (if he is to replace David Legwand), Zemgus Girgensons and even Tyler Ennis who has played center in the past. Now, the Sabres wouldn’t necessarily enter next season with all of those players poised to play center, but it doesn’t change that center has become a position of strength for the Sabres. Further, it presents the possibility of Ryan O’Reilly centering Buffalo’s third line which presents some solid matchups but puts a $7.5 million player on the third line. In total, there would be nearly $20 million locked up between Stamkos and O’Reilly before even considering what Jack Eichel’s second contract comes to bear. Additional scenarios like moving O’Reilly to the wing can obviously be considered, but on the surface there are definitely hurdles when it comes to adding Stamkos to Buffalo’s crop of centers. The cap is probably the most important thing to consider from an organizational perspective. The Sabres will have more than enough room to add Stamkos this summer. Tacking a $10-12 million cap hit next season isn’t an issue, the potential challenges come in three or four years. Even without Stamkos, the Sabres could have as many as eight players making more than $5 million (O’Reilly, Lehner, Ristolainen, Bogosian, Kane, Moulson, Eichel, Reinhart) at that time. It’s a near certainty that Matt Moulson won’t be a part of the organization’s plans for much longer and the futures of Kane and Bogosian certainly aren’t set in stone, but I’d also expect Tim Murray to be active when it comes to acquiring other impact players who could add to that number. In the short term the main question is whether or not spending such a large amount of money on one player is an effective use of resources. Would the team be best served by spending that $12-13 million on two or three different players rather than one? The Sabres are clearly improved from last year, but still lack a top four defenseman and scoring winger. The team could opt to sign the likes of Kyle Okposo, and acquire a defender such as Cam Fowler or Sami Vatanen. Those transactions would likely cost about the same as signing Stamkos and leave the Sabres with a well-rounded roster. A player of Steven Stamkos’ ability hitting the open market is something that doesn’t happen often; all 30 clubs would be more than interested if the salary cap and other factors weren’t in play. While Stamkos in blue and gold would certainly provide excitement the organization would be smart to take the prudent approach. The Sabres would be best served by adding the right pieces at the right prices rather than going all in with Stamkos. Previous Article If the Goathead is out, what about the Bisons?